Hearing begins when sound waves enter the outer ear (the visible portion of the ear) and are moved down the auditory canal, which is like a long narrow tunnel. The ear canal is lined with tiny hairs and glands that produce cerumen (ear wax). At the end of the canal lies the eardrum. The eardrum and the three bones beyond it make up the middle ear. These bones are the three smallest in the body and are commonly known as the hammer, the anvil and the stirrup. When sound waves hit the eardrum, it vibrates which causes the hammer to move. The hammer moves the anvil, which moves the stirrup and the vibrations are then transmitted to the inner ear. The job of the middle ear is to amplify sound, so damage to any part of the middle ear can cause significant hearing loss. 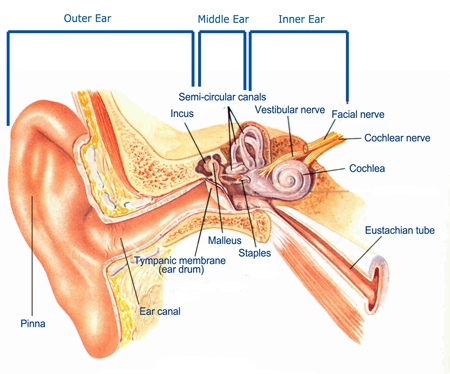 The inner ear houses the cochlea (the snail shaped hearing organ) and the hearing nerve. The sound vibrations reach the inner ear that is filled with thousands of tiny hair cells. These hair cells change the vibrations into electrical signals that are sent by the hearing nerve to the brain. The brain processes and interprets those signals into meaningful words, allowing us to hear, understand and communicate. Damage to the inner ear is irreversible-if a hair cell dies, it will never grow back.